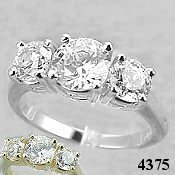 Stock #PL4375:Platinum... 2 CTW Russian CZs... Reproduced with Beautiful, Hand-Crafted, top quality Jewelry workmanship!!!... Incredibly detailed !!! Picture does not do justice to this piece!Also available in 14k White Gold or 14k Yellow Gold.